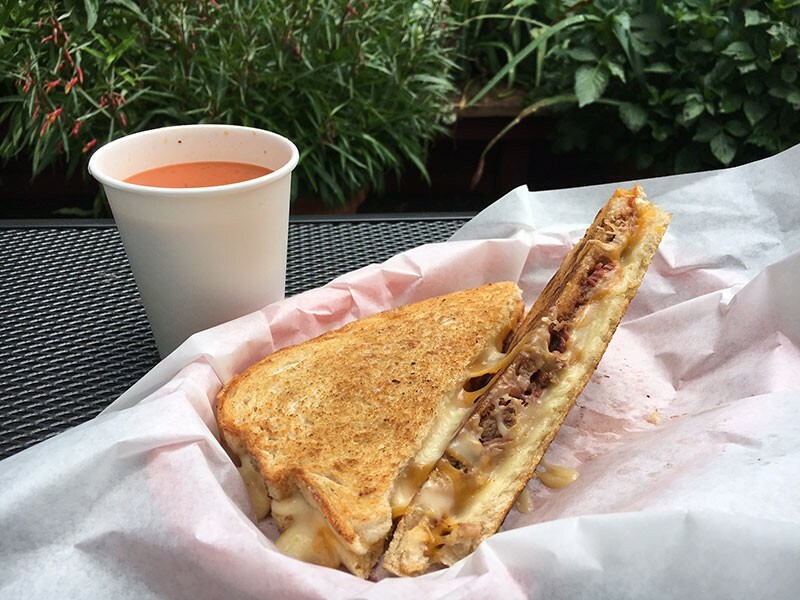 Brisket grilled cheese in the garden. Artisanal toast hasn't yet made its way past the Redwood Curtain but expect it soon. Just wait. Until then, you can work on grilled cheese. The smoked beef in the Bay Area Brisket ($7) puts up no fight, pulling apart with the gentlest tug, and it comes swathed in garlic Jack cheese, smoked cheddar and barbecue sauce on sourdough. The panini pressed bread has an audible buttery crunch and the thinness of the sandwich is deceiving. For another $4, you can add on the cookies or chips your mom would never put in your lunches and a cup of tomato soup, which is tangy with a nice dried basil flavor but comes in a coffee cup that's a little unwieldy, what with the long, architectural wedge of sandwich you're trying to dip. Cross your fingers for sunny weather because the garden in the back — complete with a long table under an arbor and a scavenger hunt for the kids — turns your quick lunch into a garden party.